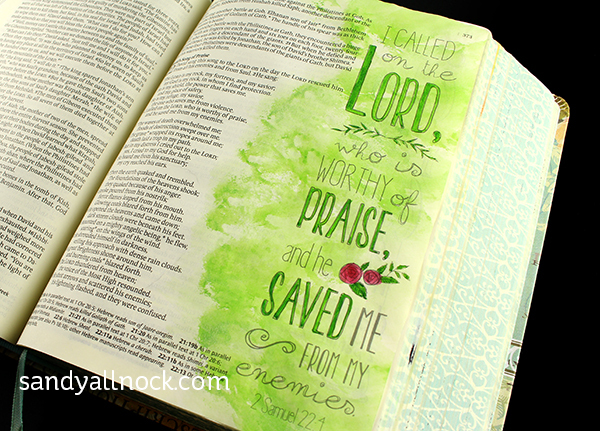 For the many people who have been begging for more Bible journaling – here’s one! I’m still only posting one every 4-6 weeks or more, it’s not a main staple for me, so I’m not able to create these videos more often. 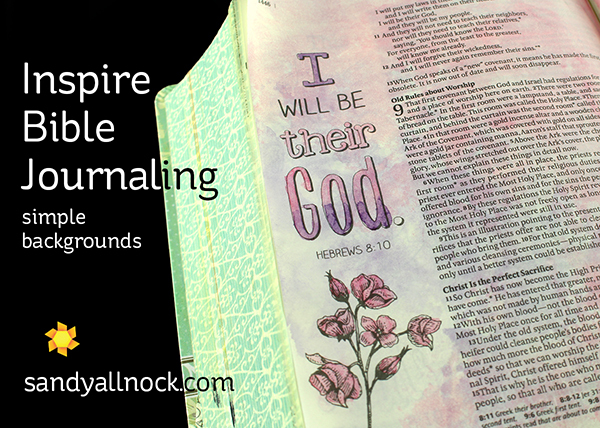 I’ve shared the Inspire Bible before…and I wanted to share an easy background technique. You don’t even have to be a fancy painter or have fancy paints – I’m using ph Martins Hydrus Watercolors, but if you can puddle paint on a palette, and if you have baby wipes – you’re good to go.Watch the video below or click HERE to see it in HD on YouTube. The background can be just part of a page or a full page. If you know how to paint flowers you could add a whole garden into the green background below – or do it in blue and make a pretty sky. Some of you have asked if I could swatch the colors for the Hydrus sets so you can decide what you might want….here you go! Pin away. Below are links to the supplies I’ve used for today’s project; compensated affiliate links may used, which means if you make a purchase I receive a small commission (not at Tyndale or Amazon) at no extra cost to you. I truly appreciate your support toward the costs of running this blog! Read more. Thanks for sharing this with us. I always enjoy your videos/tutorials–not only are you an amazing artist, but you are an excellent teacher and a inspiration!! Love those backgrounds!! Thanks for sharing. Your amazing art is a gift from God but an even greater gift is your ability to draw people closer to Him. Several months of poor health for me and my husband put a complete stop to any creativity. I just did not have the inspiration or strength. But that time drew me into spending a lot more time in Scripture and prayer which helped me heal and brought joy into a dark time. Now that I am feeling better (Praise God) I have started creating again slowly. Bible journaling overwhelms me so I decided to make Faith cards for myself. I fill the outside and inside with Bible verses, stamped images and lots of color. I had made one Faith card before I got sick and kept it where I see it often. I keep a journal during my Bible study and have a section of verses I want to turn in to Faith cards and have made several in the last few weeks. My hand writing is terrible so I print the verses I want in different fonts, sizes, etc and color over and around the printing. Making these cards totally came from inspiration from you with your Bible journaling. I love how you stress the importance of staying in the Word and not on products or techniques you use. Sorry for such a long post but my Faith cards are so meaningful to me so I thought maybe others who might be intimidated by so many pages in the Bible journals could find the same spiritual fulfillment on a different scale in making cards for yourself. It’s always nice to see the inspiration you’ve left for us. Thanks Sandy!